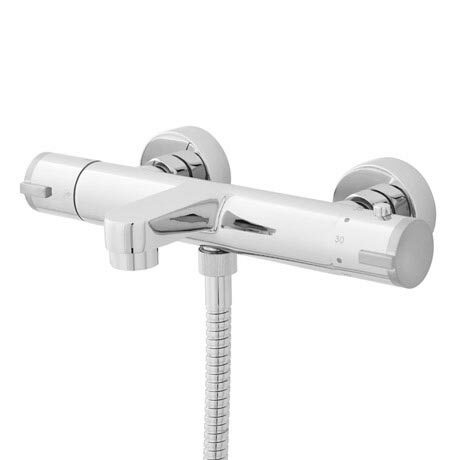 The contemporary round wall mounted bath shower mixer from Ultra, thermostatic allowing the user to control the temperature from the bar valve. The valve is designed and manufactured by leading bathroom brand Ultra. The valve is complete with a diverter to control function between tap and shower. The outlet connection is located on the bottom/Base of the valve. "Regulate the water, easy to clean and looks great in the bathroom. Couldn't find the similar type or price in the shop (B&Q/wickes), great purchase." Had to replace a faulty mixer for a client and this little beauty ticked all the boxes for a modern, contemporary replacement. Product looks much better in the flesh and more streamlined than anticipated.